This Blueberry Coffee Cake is berry, berry, berry good! This is my mother’s recipe for Blueberry Coffee Cake. 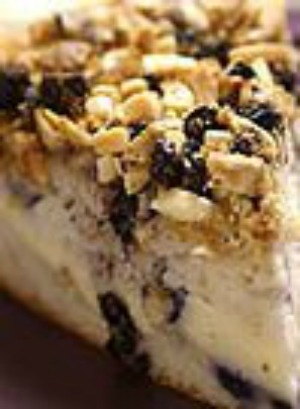 This is a moist coffee cake that is loaded with plump blueberries and topped off with a sweet streusel topping. It is great for either breakfast or dessert. Plus you could also make muffins out of this recipe. Check out Basic Rules For Baking or here for Secrets Of A Successful Cake. Also check out more wonderful Cake Recipes and Blueberry Recipes. * When buying any type of berries, shop with your nose. Always pick the plumpest and most fragrant berries. They should be firm, bright, and fresh looking with no mold or bruises. If possible, buy locally grown berries. They're likely to be sweeter and juicier than those that are bred for shipment. Select berries that are in dry, unstained containers. (Stained containers may indicate over soft berries that are not freshly picked.) Mold on berries spreads quickly. Never leave a moldy berry next to a good one. Prepare Sugar Topping. Set aside until ready to use. In a large bowl, combine flour, sugar, baking powder, salt, vegetable oil, milk, and egg. Fold in blueberries. Pour into an ungreased 8-inch square baking dish. Sprinkle prepared Sugar Topping onto top of cake batter. Bake, uncovered, 50 minutes or until a toothpick inserted in center comes out clean. In a medium bowl with a pastry blender or two knives. cut butter into sugar, flour, and cinnamon until well blended.